We awoke this morning to fresh snow that had blanketed all of the Old Faithful area. Like kids, we were all excited to see the fluffy powder and had some pep in our step as we left our cabins and headed through the still-falling snow to breakfast. Though we had sleds, they were unfortunately only used to haul our luggage back to the Snow Lodge — no downhill sledding for us, we had too many other things to see and do! 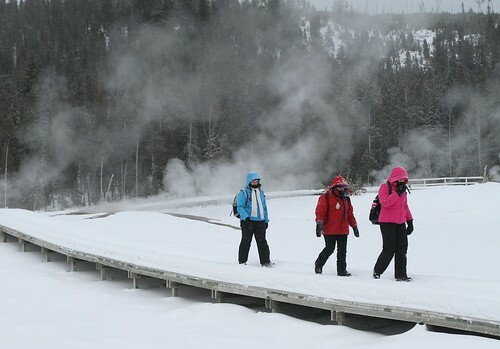 The snow followed us on and off throughout the day, adding a whole new dimension to the park.The snow truly added a new dimension to the steam from the thermal features, which we investigated up close during our first outing of the day around the Upper Geyser Basin. The feeling of being just about the only people on the boardwalks around the geysers was indescribable! As we wandered around and soaked in the beauty of the geysers, we were treated to an even bigger sight – a lone wolf was roaming through the basin on the other side of the river! We were awe-struck and speechless, taking a silent moment to truly appreciate the sight. The snow stopped for a while and the sky started to clear, giving the geyser basin a whole different appearance. We met with Ranger Rita, who has the job of going around to the different geysers and predicting when they would erupt. Some of her predicting is done by sight, whereas other predicting is more scientific with thermistors taking temperature readings of the overflow water. As we followed Rita on her cross country skis, we learned more about the geysers and what it’s like to be a park ranger. A wonderful aspect about our trip has been meeting so many people who are passionate about Yellowstone. Rita fits into that category. After giving us an up-close view of Daisy Geyser, Rita bid us farewell and headed off on her way. Our experience in the Upper Geyser Basin culminated with a viewing of Old Faithful as it went off right on time at 11:33 am. Leaving the Old Faithful area, we made a quick stop at Black Sands Pool, a thermal feature that has recently changed its pattern of energy expression. As we stood leaning against the fence surrounding the pool, all of a sudden we felt and heard large thumping vibrations from under the ground. About 30 seconds after the vibrations, bubbles of gas appeared on the surface of the pool. The pattern repeated every 2-3 minutes and was a completely different experience than we had had at any other thermal feature. One new experience led to another — as we got back on the road, we once again came across our lone wolf, just hanging out on the side of the road! 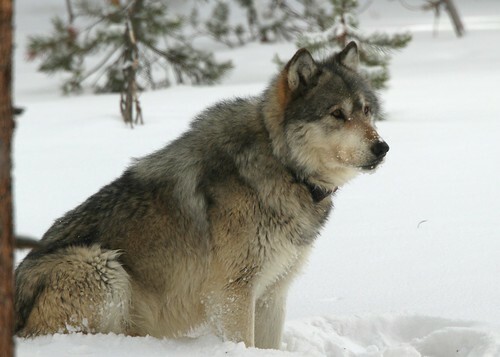 As the wolf slowly walked off into the woods, we had amazing views of an absolutely beautiful animal. What a treat to see our wolf twice in one day and to get such an up close view! The sights, snow, and steam continued as we journeyed back toward Mammoth. We made stops at Grand Prismatic Spring, Fountain Paint Pots (where we assisted an ill snowmobiler by transporting her to Madison! ), and Gibbon Falls. Many of the sights we have viewed on our trip have taken on a totally different appearance during the winter as compared to summer — snow covers most everything and the steam at the thermal features creates a blanket over the feature itself. Throughout our scenic journey, we’ve realized winters in Yellowstone are about so much more than just the visual sights. All of our senses are in use as we take in all that Yellowstone has to offer! Learning so much about Yellowstone, thanks!